I've mentioned before that we live too far out for pizza delivery to be an option, but honestly, that's a good thing. Because I can make my own pizza which is so much cheaper and healthier. This was the first time I've made pizza with a white sauce. We usually do the typical red sauce, or sometimes pesto sauce. I made the alfredo sauce from scratch, because there is nothing nastier than alfredo sauce from a jar (it's just awful!). Toppings were mozzarella cheese, fresh mushrooms, and turkey bacon. Not the healthiest pizza I've ever made (still healthier than Pizza Hut I'm sure! ), but it was delicious. Sides were a salad (once again, rejected by Pierce) and apple slices. The pizza and apples were devoured. 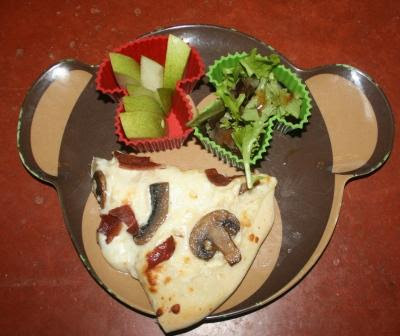 Check out more fun food ideas at Muffin Tin Mom. Your pizza looks amazing! We have the monkey version of this plate. That white sauce sounds good! I will have to remember that next time I make pizza! I've never had pizza with white sauce before! That pizza looks great..think I'll make pizza for dinner! We love homemade pizza around here. We like it a lot better than delivery (even though that's yummy, too lol). We sometimes mix a little pesto sauce into our alfredo (or red sauce, but we usually make a white pizza with mozzarella, tomato, and basil. YUM!). That pizza does look delicious! We live close enough to go out for pizza, but we almost always opt for homemade instead. It is way better that anything we could get at a restaurant. Now this is a muffin tin my daughter would be all over! You have creative muffin tins! Ooh, that does look good. While we have a few small town pizza joints to choose from we prefer home made. It is sooo much better. an unhealthy pizza every now and then is ok... ADORIBLE muffin cups, as always.LOVE the mushrooms! Look at those cute little mushrooms! I've never heard of using white sauce for pizza...my kids would love that! Looks great to me!!! I tried Alfredo sauce from a jar only once--and I won't buy it again. Maybe it depends on the brand, but the kind I had was also awful. The pizza looks really good Lisa! It's lunch time and I'd love to give it a try. I've never had pizza with white sauce. I'm so glad to hear that you use fruit as a side. My kids rarely eat vegetables so I always have grapes or apples or oranges as a backup. My husband would agree with you about jarred alfredo. Hi There, We are home from our trip. Hope you had a great Thanksgiving. I always love hearing about your creative Muffin Tin Monday posts. That pizza looks delicious. Your pizza looks 1000 times better than any store-bought pizza!!! It really does look delicious! I never thought to use alfredo sauce instead of pizza sauce! The pizza looks and sounds delicious. Surprisingly my girls love salad, they will actually ask for it. As long as they have some Ranch to dip it in. My oldest would be thrilled with a white sauce pizza. He doesn't like red sauce on anything! Yum. I'm not a big alfredo sauce fan, but I'd bet yours is delish. :) I do love me some pizza. Almost any kind, so YUM! one of the earlier meals I learned to make. A roomie worked in a shop and taught us all how to make a pie. We took turns each Sunday making our creations.I cook them on my grill in the summer. Your pizza looks divine! I look pizza! All looks good. What can "we" do to get Pierce to eat salad? Dang that looks good! I would much prefer the white sauce. Sometimes the red is sweet and I don't like that. Once again a lovely display and I would have eaten the whole thing. That pizza looks awesome! We eat pizza once a week here, unfortunately it's not homemade like yours. I've never bought alfredo sauce in a jar because it just looks gross. I need the real thing. I have used ranch dressing as a white sauce on pizza also. Very yummy. As always I love muffin tin mondays! i could not live without pizza...coal fired is my newest obsession!! they make a pesto one with garlic, tomatoes and basil. it is to die for!! my 28 year old son still won't eat salad!! Looks great Lisa. The Mrs. loves home-made pizza with mushrooms. I must hang my head down in shame....I've never had white pizza. But looking at yours, I think I may have devoured the whole deal....pizza, salad and apples. That pizza sounds good. I've never tried it with white sauce!